THE MACEDONIAN, is based on the early life of Philip II, King of Macedon, father of Alexander the Great and perhaps the greatest military genius of the ancient world. Born a minor prince of the royal house, he survives the intrigues of a family in which treachery and murder are almost a tradition. 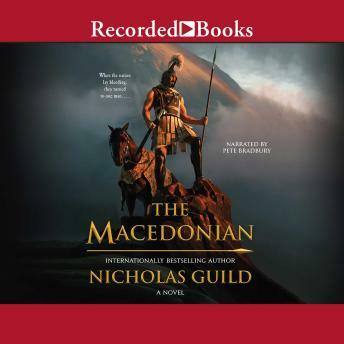 A brilliant commander while still in his teens, he becomes king when his brother, King Perdikkas, and half the Macedonian army are massacred and his country is on the brink of ruin. As wily in diplomacy as in war, he manages to stave off Macedonia' s lesser enemies while he prepares for the final struggle with the bandit empire that would overwhelm her. Yet Philip was also a man who loved and suffered. His mother hated him from the moment of his birth and he was raised by foster parents who taught him to see the truth of life as most people experience it. Shuttled about as a diplomatic hostage, the learned politics and war. In the end, after losing almost his whole family, he finds happiness with the daughter of his bitterest enemy.